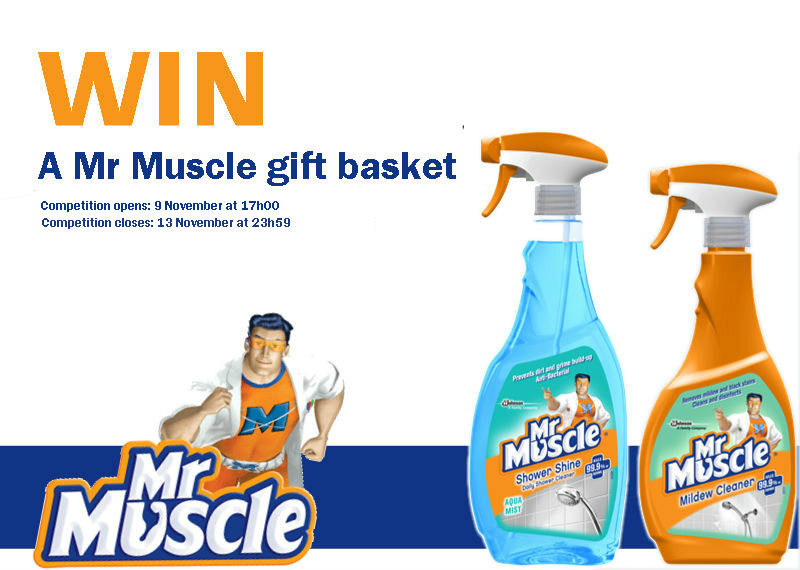 Stand a chance to win a Mr Muscle gift basket! SMS the keyword "Mr Muscle" followed by your name, surname and city to 33650 within the Competition Period. 2.1. Entries for the Competition will open at 17h00 on Wednesday, 09 November 2016 and will close at 23h59 on Sunday, 13 November 2016 (Competition Period). 4.1. SMS the keyword "Mr Muscle" followed by your name, surname and city to 33650 within the Competition Period. 5.2. We will contact the Winner within 3 (three) days from the prize draw on the cell phone number from which the entry was sent. If a Winner is not contactable within 3 (three) days from the prize draw, and after we have made at least 3 (three) attempts to contact the Winner, that Winner will forfeit the prize and we shall have the right to select a different Winner on the same conditions except that we shall only be required to make 1 (one) attempt to contact each further Winner drawn. 6.1. The Winner will receive a Mr. Muscle Gift Basket, which includes Mr. Muscle cleaning products to the approximate total value of R 250.00 (two hundred and fifty rand) (Prize). 6.3. We will contact the Winner per telephone to obtain address details and to make arrangements for delivery of the Prize. The Prize will be delivered to the Winner per courier, or as otherwise discussed, within 30 (thirty) days from the confirmation of the Winner. 7.6. We will need to process your personal information to validate your entry as well as to contact you to offer you SC Johnson products and, if you are a Winner, to make the Prize available to you. By entering this Competition, you specifically and expressly consent to us processing your personal information for these purposes and you specifically and expressly consent to SC Johnson contacting you for marketing purposes.